The new Bohemian Caverns Jazz Orchestra (BCJO) is a 17-piece big band founded by baritone saxophonist Brad Linde and co-directed by Linde and Joe Herrera. The BCJO presents a variety of music from big band literature and features some of the District's best musicians. From its April 2010 debut until March 2016, the BCJO performed every Monday evening at the Historic Bohemian Caverns on U Street. 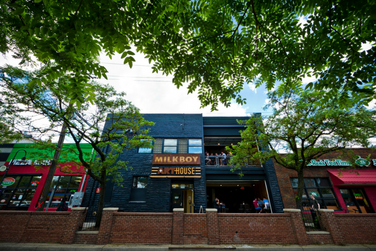 MilkBoy ArtHouse offers full dinner and bar service. Advance ticket purchase and early arrival is suggested to guarantee seating.